We know the power of reading. For many of us at Vearsa, that’s why we’re here. We’re driven by our shared love of books and a strong belief that reading can improve lives. What’s more, we know how to harness technology to distribute the best reading content, far and wide. This love of technology and books is shared by a neighbour of ours in Cork, Ireland: local primary school, St. Columba’s. This school has a uniquely inclusive ethos, with a dedicated facility for deaf students. The impressive educational agenda is firmly focused on promoting reading and digital knowledge among all students. We’ve been supporting St. Columba’s for some time now, visiting the school to meet staff and students and to give interactive talks and workshops. We also worked with some very creative fifth-class (age 11-12) students to help them turn their own school magazine into an eBook. We were so impressed by the interest of the students throughout; we were met with unfailing enthusiasm and lots of insightful questions. We were inspired to build a bespoke online reading platform, eShelf, especially for this school. We wanted to create something that would provide students with a library of engaging eBooks. That’s exactly what we’ve done. 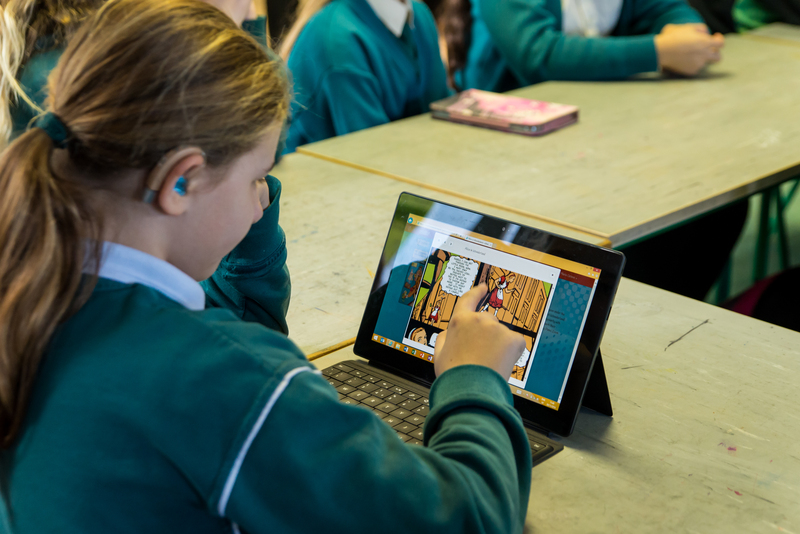 eShelf.ie is a library application that allows students and teachers to access fantastic reading material – without the need for downloading. It’s completely secure and password protected, ensuring that there is no risk of sharing or unpermitted access. 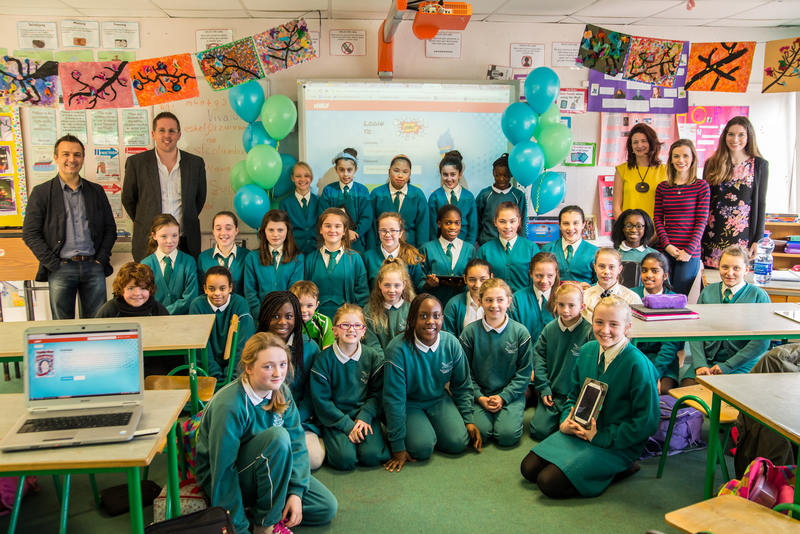 St.Columba’s sixth class students (age 11-12) got exclusive first use of the platform, then we held a formal launch at the school. It was incredibly moving to see the students using and enjoying eShelf. One girl told us “I’d gone off reading for two years but now I’m enjoying books again”. For us, these words demonstrate the endless value of the project. The students had lots to say about the eBooks on the site, offering reviews and telling us about their favourites. Many publishers have donated some of their titles to this great project, and we’re always looking for more content to add. If you’d be happy to make some of your title catalogue available to St. Columba’s students, don’t hesitate to get in touch with us. Access to eShelf.ie will no doubt have a positive impact on the students’ lives, improving print and digital literacy immeasurably. A 2013 report by the Department of Education and Skills, ‘Views on digital literacy in Irish Education’, explores the benefits of print and digital literacy. It suggests that “reading literacy involves understanding, using and reflecting on written information in a range of situations including both digital and printed text…in order to achieve one’s goals, develop one’s knowledge and potential and participate in society”. By providing these eBooks, we’re giving the next generation tools to develop their skills and knowledge, improve their lives and aspirations, as well as contribute to society. And we're not stopping there. eShelf is constantly a work in progress, as we seek to enhance the content, streamline the software and increase its positive impact even more. If you feel you can support us in this project, we'd love to hear from you. After all, we all know the power of reading.